is an innovator of form and a key figure in Japanese contemporary theatre. He founded chelfitsch Theater Company in 1997. Named after a deliberate mispronunciation of the English word “selfish,” chelfitsch Theater Company came to be known for Okada's idiosyncratic vernacular language representing contemporary youth culture and astonishing imagery.Okada poses hard-hitting questions about the complexity of the ultramodern post- Fukushima Japanese society. At the same time, his art is universal and timeless. Ichihara narrates the absurdity of life and the vitality of humans who shine in the rankling world from the perspective of women, delivered mainly through monologues. While setting great value on the bodies of performers, she also emphasizes the expression of texts and their rhythms. Her works are carefully built as if from an outside perspective into the behaviors of humans and animals, and aim to immerse the audience in the vibrancy and the bounding pulse of life. Born in Lima, Peru in 1982 and raised in Kawasaki-city, Japan, Kamisato is the director of Okazaki Art Theatre, which he organized in 2003. He participated in Festival/Tokyo 2010 through 2012. In 2006, Kamisato became the youngest person ever to win first prize in the Toga Directors Competition, and 2. Kamisato writes plays along lines that are extensions of his concern about his own identity and reflect upon the problems faced by immigrants and workers, the relationship between the individual and nationality, and communication with others living in the same age. His work elucidates his attitudes towards politics and society, questioning how people can coexist with Others that they cannot understand. a playwright and director, has been an outstanding figure in Japanese theatre since the 1980s. He writes and directs for his production company, KOKAMI@network and for other theaters; in 2004 he directed “Romeo and Juliet” at the Tokyo Globe Theatre, and on the invitation of Yukio Ninagawa he directed The Merry Wives of Windsor in 2002. In 1995 Kôkami received the prestigious Kishida Drama Prize forSnufkin's Letter. 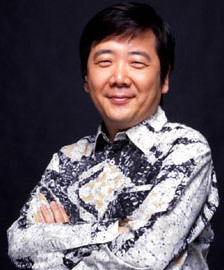 His other awards include the Grand Prix for Tokyo Game in the short film category of the San Diego Film Festival (1994) and the Kinokuniya Drama Award in the Group Category for With a Sunset Like the Morning Sun (1987). is one of the most prolific and political playwrights alive in Japan. Born in Okayama Prefecture, Sakate is leader of the theater company Rinkogun, which founded in 1983 and has written and directed almost all of their productions since. For Sakate, theater is not just a means of individual expression but also a type of media, and through the theme of conflict between the self and the social collective, he explores politics, war, and religion from a journalistic perspective. Leader of the theater company Ikiume, Maekawa is the focus of increasing attention in the theater world for works that bring a sense of wonder into everyday life situations with touches of science fiction, horror and the occult. Through situations such as aliens that enter and usurp control of human beings, other worlds that are neither heaven nor hell, time machines that rewrite events of the past and other bizarre elements, he creates a unique world with its own view of human nature. His play The Sun was made into a film and published in English translation.